-->Kochi, Sep 7 (IANS) Malayalam superstar Mammootty's phone rang non-stop Friday with well-wishers greeting him on his birthday, but for the veteran actor it was work as usual. "There is nothing special for the day and I am shooting for Renji Panicker's latest film here," Mammootty told IANS. 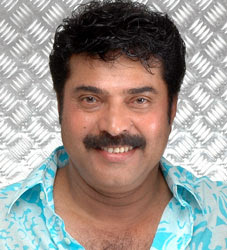 And when asked about his age, he replied: "Mammootty today is 26 years old in the Malayalam film industry. "He also clarified that he had no role in an advertisement in a leading newspaper, asking people to wish him a happy birthday by calling a particular number. "I do not know anything about that," said the star, who is in his 50s. And the film he is shooting for is equally special as Mammootty will don the cop's uniform for the 25th time in an acting career spanning over 25 years. It was the role of a police officer in the movie "Yavanika" in the early 1980s that propelled his career to newer heights.Since then he has had no reason to worry about the success of a film in which he donned the khaki uniform.